Oddly, this process was a very emotional one for me. Not because I am particularly attached to my junk--most of it truly was just that, junk. But I came across so many things that had been tucked away and forgotten--journals from my youth, letters from my mother, cards exchanged with my sweetheart, my children's blessing clothing, and many little knick knacks that brought a flood of memories. In the basement,I happened upon a bin full of linens and blankets, one of which was this one. It's a bow-tie quilt that my mother got from my Great-Aunt Radie. I remember Aunt Radie's little yellow clapboard house that smelled a bit funny to a me as a child. I remember how she welcomed us with such delight every time we arrived, and how she covered her mouth when she smiled as she was missing several front teeth. This quilt was made from pieces of her own dresses. And it is perfect. Perfect because it shows off her vibrant and colorful personality. Perfect because it reminds me of my heritage. 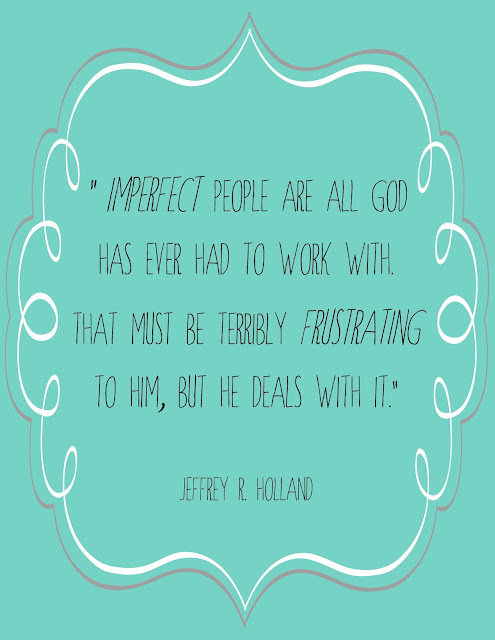 Perfect because it is imperfect--just like us. The square on the right is just not right. 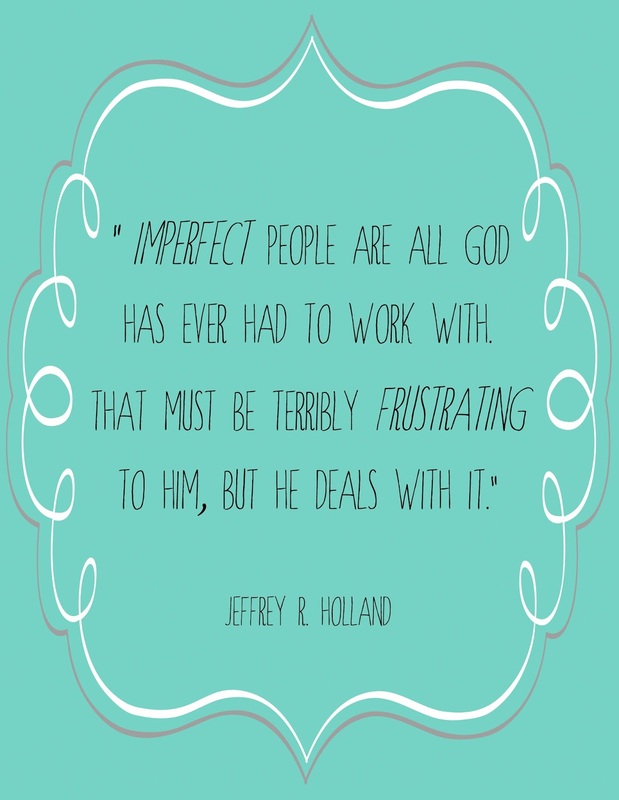 Yet it's perfect to me. During my digging, I also came across another handmade treasure that made me gasp. I had totally forgotten it was there. This blanket was made by my paternal grandmother. As I fingered this lovely blanket, the memories came flooding back. My grandma could do about anything--drive a tractor, hoe a row of onions in minutes, build a fire, turn the water, tat, sew, milk a cow, and love her grandchildren. She was fiercely loyal to family and the Lord. She arose at four o-clock every morning, long after the cow was gone, just because. She loved to sing, play the piano, roast marshmallows and weinies, and make homemade donuts. She loved to teach and loved to serve. Her feet, and pot roasts, were dry; her hands were always busy. I named my daughter after her--her little namesake she would say. To have this blanket that she made with those loving, hard-working hands makes me happy. Very happy. I suppose that these little treasure-finds could be just that. Some lovely handmade things. But they are so much more to me. They are joyful memories of loved ones. They are lessons I have gleaned from my time with them. They are cherished. By the way, these two precious blankets are NOT going back in the bin. I am going to leave them out and enjoy them--use them to remember where I came from and share with my children lessons of the cherished people that preceded them. Hopefully they can glean something from me in the process. Just beautiful, Susan! Thank you so much for this special post. You made my day. Thanks, Judith! I'm happy about that! Thanks, Susie! I would really hope that they would be pleased. And I wish I could share a bit of this creative journey with them. It's delightful to carry on the creative gift across generations. I know that you, too,have an understanding about these things! Hugs. I hope that someday my own grandchildren will find the same memories in my crocheted works that I give to them.